Tiago Zarco lies alone, in a dark cell, licking rainwater off the walls for a taste of freedom. It is a compelling opening to a compelling novel -- Guardian of the Dawn, by Richard Zimler. This is the third instalment of the author's 'Sephardic cycle' (following the best-selling Last Kabbalist of Lisbon and Hunting Midnight), tracing Jewish experiences of persecution through generations of one family. What makes it special for us is the setting: Sixteenth century Goa. Guardian of the Dawn deserves to be read because it focuses on a period in history few of us are familiar with -- the Inquisition in India. 'They'd arrest Christ if he dared show his face in this wretched city,' writes Zimler, referring to the paranoia of a colony living under a corrupt regime. By the time the sixteenth century drew to a close, Goa was under Portuguese rule. The Catholic Inquisition was on in full swing, and the practice of any other religion was forbidden. Native Hindus and immigrant Jews were branded as 'sorcerers'. Those who refused to give up their beliefs or betray those still practicing them were strangled or burnt alive in public autos-da-fe -- a word that means 'act of the faith' and refers to sessions of the court of Inquisition. Into this setting made for the historical mystery novel, Zimler introduces us to the Zarco family. After years of sticking to their Portuguese-Jewish roots, the Zarcos are betrayed to the Inquisition. Father and son are imprisoned. Tiago Zarco's father is tortured by the Portuguese, but chooses to kill himself rather than reveal the names of converts practicing Judaism. Eventually, Tiago finds himself in the same cell once occupied by his father. Resisting conversion, he escapes death but is exiled to Lisbon. He uses this time to re-examine his childhood meticulously, trying to figure out who betrayed his father and him. Following his release, Tiago returns to India bent on revenge. When the source of betrayal is revealed, however, his plans change beyond recognition. Guardian of the Dawn moves between prison and Tiago's recollections of a happy childhood. It documents his drastic development from gentle, compassionate soul to a man consumed by murderous rage. Zimler also uses his novel to document, effectively, the cruelty and fanaticism of the Portuguese invaders. He tells me that thousands of Jews, Muslims and Hindus perished in the autos-da-fe. When I promptly question his sources, he replies: "There is a lot of information online. 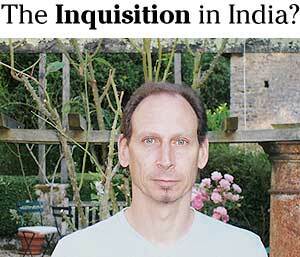 I also used A K Priolkar's The Goa Inquisition. It says the Inquisition played a prominent role both in bringing pressure on secular authorities to pass discriminatory legislation as well as enforcing those measures. It also documents the dates of public autos-da-fe -- like September 20, 1562, November 15, 1563 and June 27, 1563, etc. -- and says that there were 16,172 cases tried by the Inquisition between 1561 and 1774. Another useful book was Romesh Bhandari's Goa. Bhandari says by the end of the seventeenth century, it is estimated that out of a population of 250,000, only 20,000 were non-Christians. These included large numbers of traders and visitors who were in Goa temporarily." Richard Zimler is an interesting man. He was born in New York, in 1956, to a secular Jewish family. His grandparents came to America from Poland at the turn of the century. Though he didn't practice Judaism, he grew up within the culture. He had regular tastes as a child -- sports, comic books -- and went on to study comparative religion and music at Duke University. He played classical guitar for a while, then went to Stanford University for a Masters in journalism. After working as a journalist for eight years, he moved to Portugal in 1990 and has taught journalism there since. He has also, over the last decade, published more than 20 short stories and six novels that have appeared on bestseller lists in 11 countries. Numerous awards have followed, including a 1998 Herodotus Award for best historical novel. The Last Kabbalist of Lisbon was picked as 1998's Book of the Year by British critics, while Hunting Midnight has been nominated for the 2005 IMPAC Literary Award. Interestingly, Guardian of the Dawn has just hit the bestseller list in India. It is, strangely, listed in the non-fiction category, but people have begun reading it, which is good. Read an exclusive extract from Guardian of the Dawn! When he is not writing or teaching, Zimler enjoys gardening. He is still surprised his books are published in places like Poland and Turkey, and can't get over the fact that he has had a chance to talk to readers there. "I've been very lucky," he tells me. Given the hard work he puts into his work though, I think it's all rather well earned. Why the decision to write about the Portuguese Inquisition in Goa, I ask, considering it must have been a whole other world for him to explore. "I have always been interested in writing about injustice and people whose voices were silenced," he emails in reply. "And I love writing about events most people would prefer to forget about. In a sense, Guardian of the Dawn became my revenge against religious fanatics. Every time a reader opens the book, I consider that part of my revenge!"